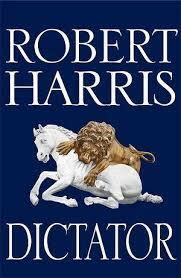 We talk with novelist Robert Harris about the last book in his trilogy about the Roman statesman Cicero, Dictator. Then, economist James Galbraith tells us why he disagrees with the attacks on Gerald Friedman’s analysis of Senator Bernie Sanders’ economic plan. And finally, we pay tribute to Dr.Quentin Young, who passed away this week, with a clip from an interview Francesca did with him in 2009. Robert Harris’ acclaimed historical novels are written with a keen eye toward the lessons we can derive from history for our own time. In 2014, he came onto Writer’s Voice to discuss his book about the Dreyfuss case, An Officer And A Spy. Dictator takes place during a time of great civil unrest, when the Roman republic was giving way to the rule of the emperors. Cicero was a constitutionalist who was deeply committed to democracy. He was a former elected consul or leader of Rome. But in his last years, his political ambitions were stymied by the growing power of Julius Caesar, who became Rome’s first emperor. It is this conflict between democracy and dictatorship that drives the action in Harris’ novel, from Cicero’s first fall from grace to his execution in 43 BCE. Roman democracy was only for free male citizens of Rome — it excluded slaves, women and foreigners. But Dictator is told through the eyes of a slave, Cicero’s long serving assistant, Tiro, who, as a historical person, actually did write a biography of Cicero (now lost.) As both outsider and insider, the character Tiro allows the reader to gain a fuller perspective of his master and his society. Robert Harris is the author of ten novels, as well as screenplays, short stories and nonfiction. 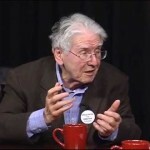 Several weeks ago, Writers Voice talked with economist Gerald Friedman about his analysis of Bernie Sanders’ economic plan. That was before the New York Times published a denunciation of Friedman’s analysis, claiming that seven “left-leaning economists” questioned its validity. (It turns out that none of the economists are particularly left-leaning and one, Ezra Klein, isn’t even an economist.) Four of the economists were former chairs of the Council of Economic Advisors. 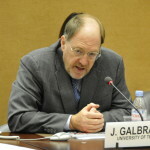 James K. Galbraith is an expert in income inequality, and a professor at the Lyndon B. Johnson School of Public Affairs and at the Department of Government, University of Texas at Austin. His most recent book is Inequality: What Everyone Needs to Know. Dr. Quentin Young passed away on March 7 at the age of 92. He was a crusader for single payer and for the health of workers and the poor. His patients included Martin Luther King and Studs Terkel and Barack Obama was a patient in his practice and a personal friend. Francesca interviewed Young in 2009 for Sea Change Radio at the time Obamacare was being developed. They spoke about single payer and why Young thought it was the only sensible design for providing universal health care. We play a short clip from that interview, but you can hear the whole interview here.